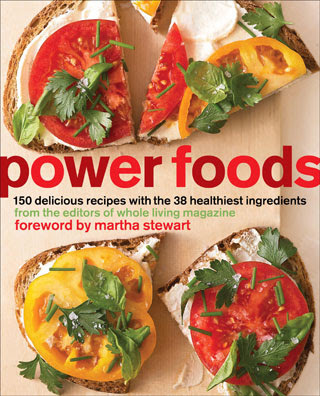 A few weeks ago while shopping at Costco, I picked up a new cookbook titled, 'power foods'. It's a compilation of recipes from the editors of Whole Living magazine, a Martha Stewart publication. The beautiful cover drew me in. That, and the tagline - '150 delicious recipes with the 38 healthiest ingredients'. As it turns out, my friend Bev, also a food-blogger, just got the exact same cookbook recently. She's made a few different recipes from the book so far, and this food is totally her style. If it's your style, too, you should definitely check out all of her fabulous recipes over at Bev Cooks. I love everything she posts - seasonal, simple, flavorful, fresh. And, best of all, healthful. Beets are the power food in this recipe. Not only are the beets themselves packed with cancer-fighting beta-carotene and folic acid, but the greens are, too. They can be treated just like their botanical cousin Swiss chard and are even more nutritious than the roots, with double the potassium, folic acid, calcium, and iron. And, they should be pictured above, but the beets at the grocery store today did not still have their greens attached, and I forgot to grab some Swiss chard as a substitute. I love beets. Absolutely love them. I have since I was a child. My mother has a picture of me covered in the stuff. Beets are no joke. Their color is vivid and transfers easily. As I was using paper towels to rub off the skins (they're much more easily removed after cooking) tonight, it honestly looked like a major accident had occurred. I seriously contemplated playing a cruel joke on The Stallion involving screams and near-fainting while clutching my hand with the beety towel, but alas, I am just too sweet. Like these beets. I devoured one before I was even half-way through finishing dinner prep. I also feel compelled to inform you that if you eat enough beets, it'll turn your pee pink. Hey, I don't want to talk about that, either, but I also don't want any of you lovely people to start calling your doctor for something completely normal. Wow, what a great transition back to dinner. This was a cinch to pull together, and a great light winter meal. I roasted the beets, but if you boil them, they'll cook faster. And honestly, I have to disagree with Martha - there's not a big loss of flavor if you do boil them instead. Preheat oven to 400℉. Loosely wrap beets in parchment paper, then wrap packet in foil. Place on a rimmed baking sheet and cook until easily pierced with the tip of a sharp knife, 45 minutes to an hour. When cool enough to handle, rub off skins with paper towels. Reserve 1 beet; half and slice remaining beets. Season pork all over with salt and pepper. Place on a rimmed baking sheet and roast until reaching 138℉, 14-16 minutes. Transfer to a cutting board and let rest 10 minutes before slicing thinly. Meanwhile, process the reserved whole beet with 1 tablespoon oil in a food processor until smooth. Place beet mixture into cheesecloth and squeeze to extract juice (yield approx 1T + 1t juice); discard solids. Add mustard, 2 teaspoons vinegar, and 2 tablespoons oil; whisk to combine. In a large skillet, heat remaining 1 tablespoon oil over medium. Cook garlic, stirring, until fragrant and golden, about 1 minute. Add beet greens and 1 teaspoon salt; season with pepper. Cook, stirring occasionally, until greens are wilted and tender, 2-4 minutes. Remove from heat and discard garlic. Add sliced beets and remaining 1 tablespoon vinegar, and toss to combine. Sprinkle with pine nuts. To serve, drizzle beet vinaigrette on each of four plates, dividing evenly, then top with pork and beet greens. Great service and the people that work here are so kind! They immediately offer to explain the self-order screen to you if it's your first time here. Also if it's during the busy lunch hour someone brings out the orders to where you are seated. The food and desserts come out very quickly also! Very clean environment http://www.breakfastnearmenow.com/locations/breakfast-places-near-me/. I went to eat with friends last week. Good price, good food, really friendly staff. Their Kungpao Chicken, orange chicken was one of the best ones I've had. Definitely would go back. I recommend this if you are placed in the area stop by.